Photographic prints on canvas that are stretched and wrapped around a wooden frame are a popular and innovative way of presenting inkjet printed images. Traditionally, the method of producing canvas wraps involved making a wooden frame and then using stretching and stapling equipment to attach the canvas to the frame. With the new Gallery wrap system from Ink2image, a canvas wrap can be made in a matter of minutes with no special tools or training. 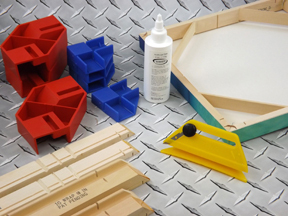 The Gallery wrap system is extremely simple to use, and consists of self-adhesive stretcher bars from 8” to 60” in length, re-usable corner assembly guides, corner pins and braces, and archival glue. The process of making a wrap is very easy – the only tool needed is a sharp knife – and takes about five minutes on average. Full instructions are included with every Gallery wrap product. The system is also extremely cost effective – a 16” x 12” wrap is less the $ 13 including canvas – and compares to traditional and more complicated wrapping methods. System bars are supplied in two ranges - the standard 1¼” depth range from 8” to 24” in length, and the Pro 1¾” depth range from 20” to 60” in length. All bars within a range are interchangeable so all size formats can be made. With the Pro range, center braces are available to prevent bowing on larger wraps over 30” in length. The video below from the manufacturer shows how a 24” x 36” print is wrapped and trimmed. Firstly, a corner kit is needed and these are shown below. Decide whether you want to make wraps using the standard 1 ¼” deep bars (from 8” to 24” in length), or the Pro 1 ¾” deep bars (from 8" to 60” in length) and order the appropriate corner kit. Each kit contains the four re-usable corner assembly guides, and a 4 oz bottle of archival glue (enough to make dozens of wraps). Spare bottles of glue are also listed below. Next, order the bars you require using the links below. Standard bars are supplied in packs of 2, 12, or 20, and the Pro bars in packs of 2 or 8. All bars come with the required corner braces and pins.